Whether seedeaters, hummingbirds or fruit eaters are in your yard, you can offer each a little something special to ensure regular visits. Good quality feeders may seem costly but in the long run, they will actually save you money, aggravation and frustration. 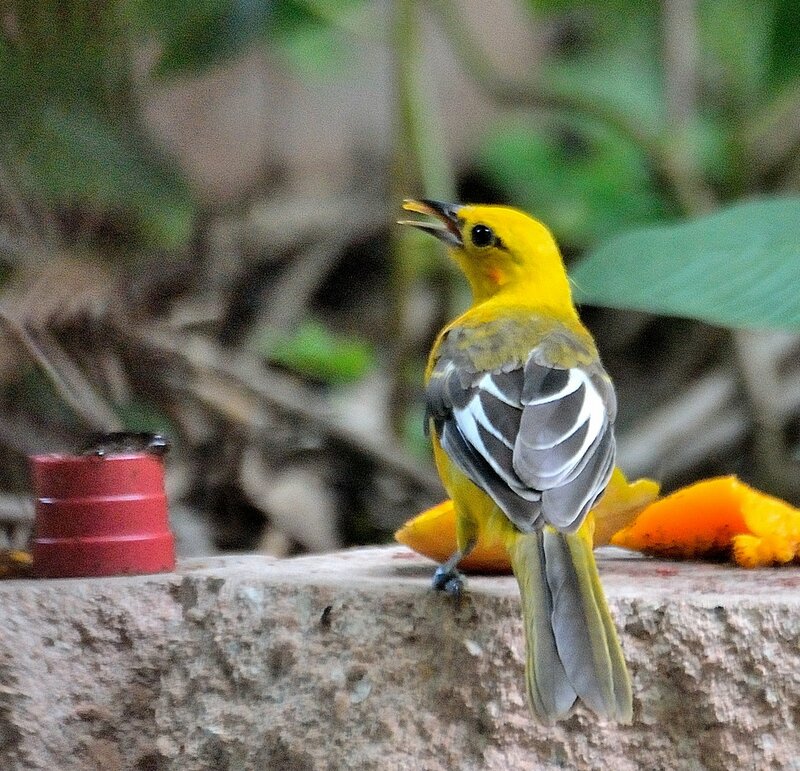 In our tropical climate, proper care of feeders is a must. We also have very clever squirrels and other opportunistic rodents that we must outwit. A baffle system or squirrel proof feeder is necessary if you wish to keep the seed from disappearing at an alarming rate. Birds feel vulnerable when out in the open so try to place your feeder near a bush or tree, but far enough away (10-12 feet) so squirrels can't jump on it. They are natural acrobats and will amaze you with their persistence and logic! 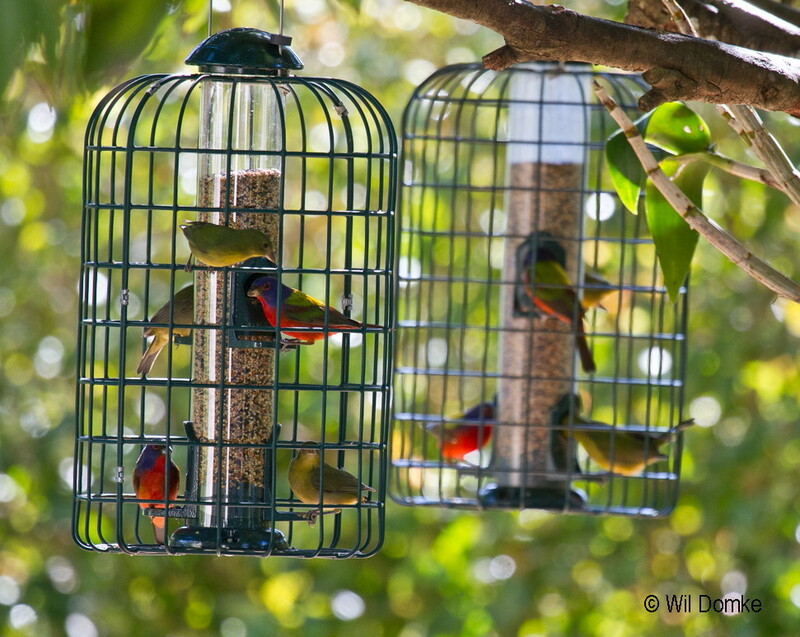 The feeders can be hung or mounted on a pole. 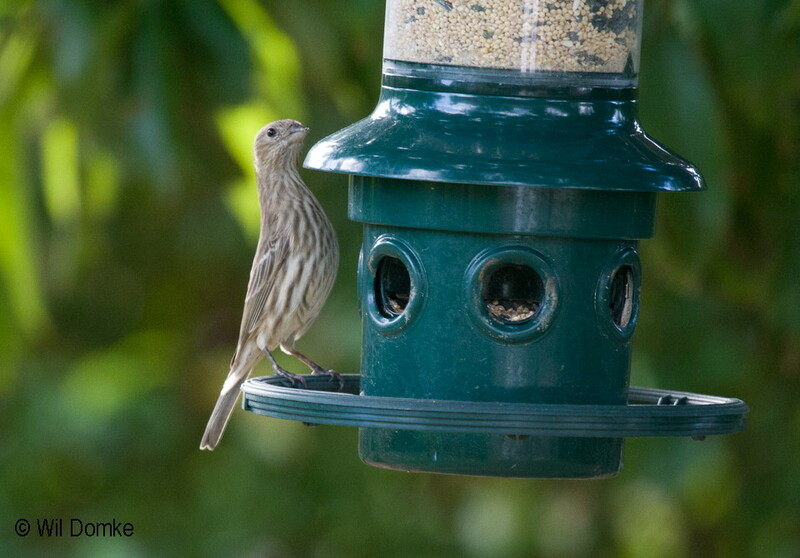 It can take a while for birds to discover a new feeder so it's best to put minimum amounts of food until they include the new feeder in their daily feeding route. Water is a great attractant and enjoyed by all the birds in your yard. 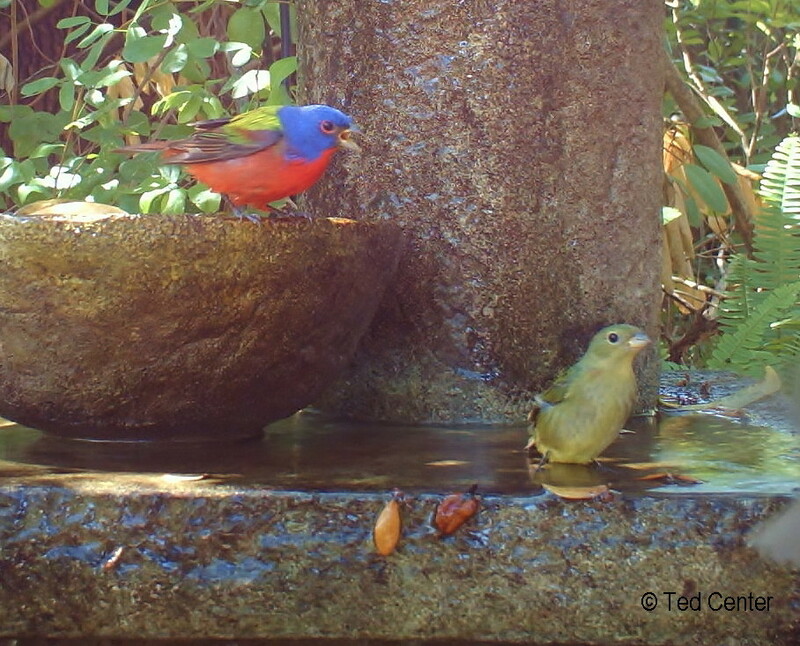 It is very important to regularly clean your birdbath and replace the water. The closer it is to bushes or vegetation, the more readily the birds will use it. Moving water, such as a dripper or recirculating pump, is even better and acts as a magnet for birds. Searching the Internet for “bird dripper” provides many choices. 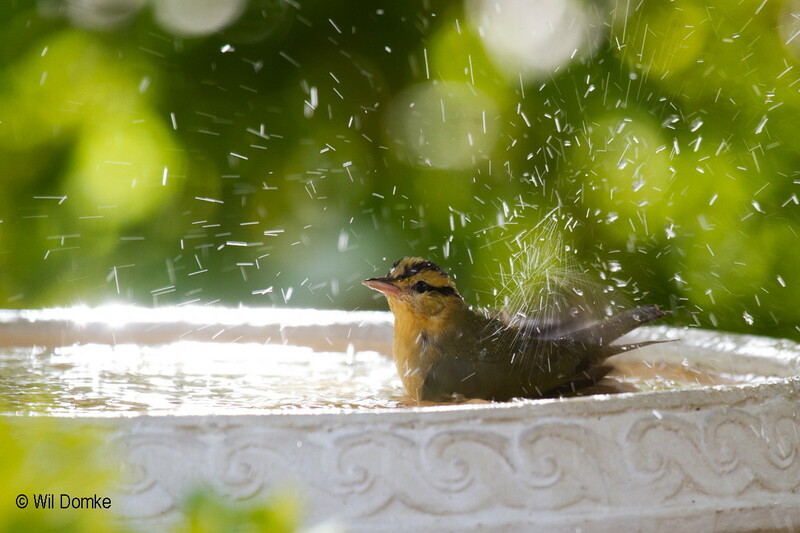 Moving water also keeps the bird bath clean and discourages mosquitoes from laying eggs. 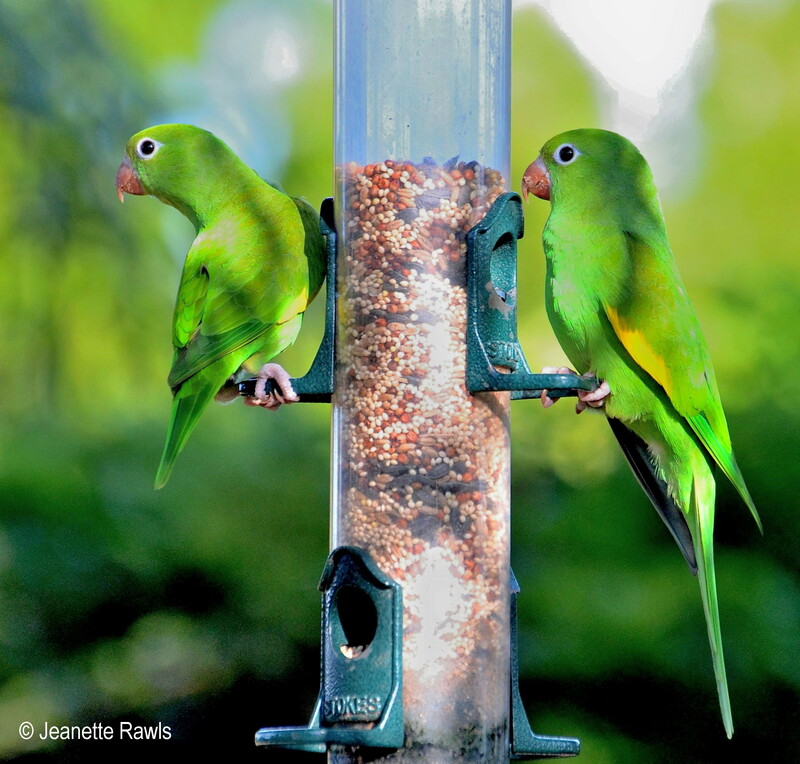 Two basic types of seed feeders work well in South Florida; the tube feeder and the hopper. Droll Yankee makes excellent tube feeders and you may opt to add a round tray at the bottom for larger birds like Northern Cardinals and Blue Jays to perch. Some companies also make tube feeders within wire cages to keep out larger birds. Heritage Farms Absolute hopper has an adjustable spring weight perch that closes the seed ports with a squirrel's weight. You can control how large a bird will be able to perch without triggering the closure. A third option is a combination of the two designs, called Squirrel Buster Plus. This is a hanging feeder with no need for a baffle, as long as the feeding ports are out of the squirrel's reach. If a squirrel gets on top of the feeder, its weight closes the feeding ports as it slides down the tube. The “skirt” that provides perches can be adjusted to discourage larger birds from eating all the seed. Black oil sunflower seed is the universal and most preferred seed. It has the most nutrition per seed and the shell is fairly soft. Northern Cardinals can eat striped sunflower seeds but this seed is hard for other birds to crack open. Most importantly, avoid cheap mixed seed with red millet (large red seeds). It's used as filler, which the birds don't eat and it makes a mess, eventually rotting. White millet is eaten by doves and Painted Buntings but can sprout if the area is not raked clean. An excellent combination is black sunflower seed with some white millet in a Squirrel Buster Plus. Finch Supreme seed is a favorite for Painted and Indigo Buntings. Store the seed in a cool, dry location and keep the feeders clean. A 50/50 solution of white vinegar and hot water works well as a cleaning solution. If birds go to the feeder and don't eat, check the seed, it may be old. Discard wet or moldy seed and keep the area under the feeder clean and raked. Use a platform or some type of open feeder if you wish to feed doves, grackles and parakeets. 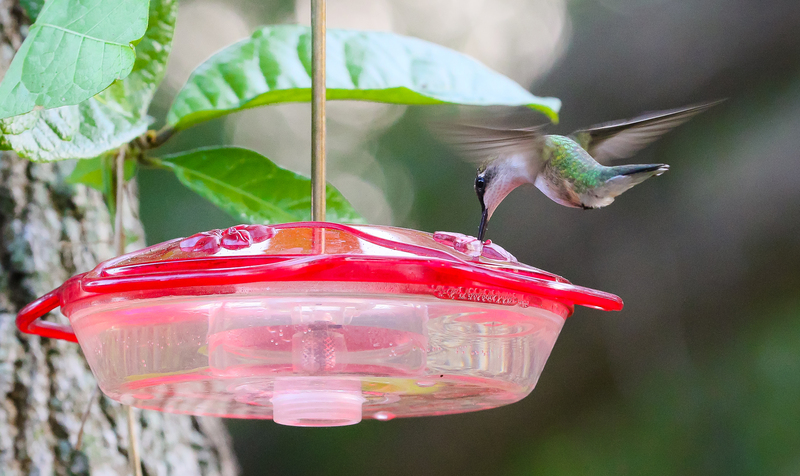 Our wintering hummingbirds usually arrive in October and remain until early April. They are fun to watch and readily eat from nectar feeders. The best feeder is a flat design with an all-red top (yellow attracts wasps and bees). Aspects Company makes quality small capacity hummingbird feeders that are perfect for our warmer climate. The HummZinger Mini holds 8 ounces and even better, the new HummBlossom holds 4 ounces. Since the sugar water has to be changed every 3-4 days here in South Florida, these small flat feeders are excellent. Once the solution ferments due to heat, the birds won't touch it. You can easily make your own sugar water: 1/4 cup sugar to 1 cup of water is the correct proportion. Heat until sugar is dissolved, cool and then keep refrigerated until needed. If you opt to buy nectar mix, don't use the kind with red dye, since it promotes bacterial growth or can cause an allergic reaction in birds. While our wintering Gray Catbirds and Spot-breasted Orioles are around, an offering of fruit is sometimes appreciated. A half of an orange spiked to a tree limb or a small container of grape jelly can attract fruit eaters. Because of South Florida’s warm weather, fruit offerings should be changed frequently. A universal favorite is “summer suet,” made with ingredients to withstand our heat and humidity. Though it requires a small amount of preparation, the reward of watching the birds attracted to it, is worth it. The crumbly suet can be formed into cakes, offered on a piece of wood, placed in a small wire basket, on a platform or even spread on the bark of a tree. Woodpeckers, Gray Catbirds, Northern Cardinals, Blue Jays and even some warblers love this mix. To make it, mix: 1 cup crunchy peanut butter, 1 cup cheap vegetable shortening, 2 cups quick oats, 2 cups cornmeal. Heat and mix first three ingredients over low heat and gradually add cornmeal until the consistency is mealy. Refrigerate until ready to use.